For over two millennia, Maya cloth and clothing have served as artistic expressions communicating layers of meaning both to the Maya themselves and to informed outsiders. The communication is a kind of visual literacy; one must be able to "read" cloth, clothing, and the manner in which it is worn. For the first-time traveler to Guatemala, the clothing or traje worn by the indigenous people may impress and startle. 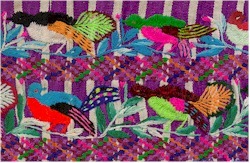 It is handwoven or embroidered in rainbow colors with geometric, floral, animal, or human designs. A woman's dress ensemble includes a multicolored upper garment called a huipil; a solid colored or patterned skirt called a falda or corte; an embroidered or woven belt or faja; adornment for the head or hair called cinta or liston; and a variety of multipurpose cloths called tzute, toalle, servilleta, or cargador. Men may wear shirts or camisas and trousers or pantalones of tie-dyed or ikat cloth known as jaspe, short woolen kilts or rodilleras, black woolen overgarments called gabones, shoulder bags or morales, and sombreros. In some communities men wear headcloths or tzutes, and some wear their hats on top of these cloths. Artists of the loom respond to new materials, techniques, and patronswho may be tourists or entrepreneurswho may be local or from foreign countries. For this reason innovation and change in design layouts and dress styles are inevitable and very exciting.